The story of the lunar landing and the events that led up to it, told in text and visually stunning 3-D images. July 2019 marks the fiftieth anniversary of Apollo 11's epochal lunar landing, when Neil Armstrong and Buzz Aldrin walked on the surface of the moon. 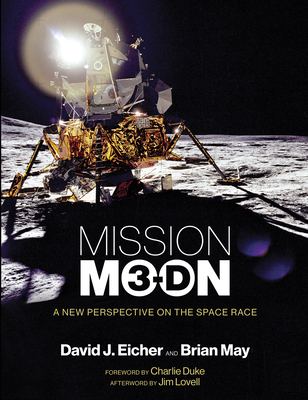 This visually rich book offers a new perspective on that historic accomplishment, telling the story of the lunar landing and the events that led up to it with text and 3-D images. A 3D viewer, designed by astrophysicist (and lead guitarist with the rock group Queen) Brian May is included with the book. Mission Moon 3-D offers unique access to the Apollo astronauts and what they saw. It tells the story of the US-Soviet space race, from Sputnik and the space dog Laika to Mercury, Gemini, and Apollo. In 1961, President John F. Kennedy declared that America would put a man on the moon by the end of the decade. On July 20, 1969, Neil Armstrong guided the Eagle to a safe landing on the edge of the moon's Sea of Tranquility. President Richard Nixon told the astronauts, and the nation, that it was "the greatest week in the history of the world since the Creation." Mission Moon 3-D recounts all this and more in memorable and visually stunning fashion.